I intended to blog about this FO before our departure, but never got around to it. On the last day before our flight, I was searching for ideas on how to photograph the bag, and could not come up with anything. So I thought, why force it? 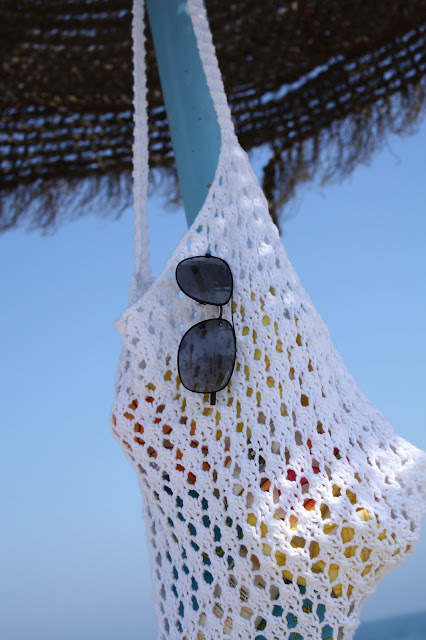 After all, the best way to show off a beach bag, is to photograph it in its intended environment, right? So I packed it up and off it went to Spain. This is a pattern that I put together myself. The inspiration came from a scarf pattern of Joelle Hoverson's, and it' also very similar to a Purl Bee pattern that I had knitted last year. I wanted a bag that could be worn cross-body, I find that practical, so I added a simple garter- stitch strap. It does stretch quite a bit with wear, especially if the bad is heavy, so the next time I knit it up, I will have to come up with something to prevent that. For anyone interested , I wrote up the pattern in Ravelry, here. As soon as the rest of my vacation are downloaded and formatted, I will be posting about Spain...a seriously amazing experience! Stay tuned! Thank you ladies, I always enjoy hearing from you!